Lucan Sarsfields Golf Society 2019 AGM will be held in the clubhouse on Monday 4th March at 9.00pm. All are very welcome. Gerry Mescall is the Society Captain for 2019 and we wish him well and ask you to support Gerry and your Society during 2019. 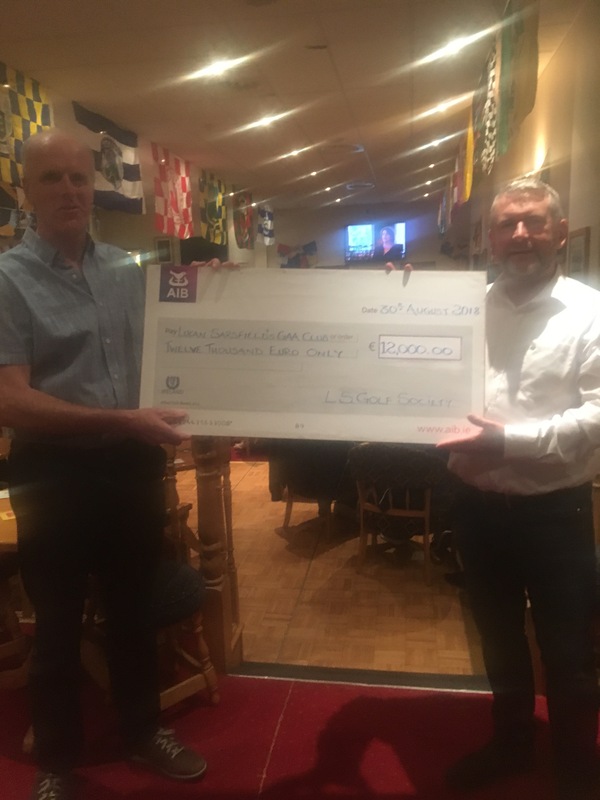 Friday 21st June 2019 – Lucan Golf Club – Annual Classic. Golf Society Seamus Fagan’s Captains Day Results. Category 1 Winner Jack Butler (15) 32pts, Category 1 runner-up Mick O’Hara (16) 31pts. Category 2 Winner Billy Hayes (19) 33pts, Category 2 runner-up Dave Murray (18) 32pts BB9. Category 3 Winner Pat Keane (23) 32pts, Category 3 runner-up Liam Carton (31) 26pts BB3. Thanks to Kilcock Golf Club and also to the Lucan Spa Hotel for hosting the Captains Dinner. Special thanks to Gerry and Cathal Reynolds, Seamus Clandillon, Stephen Murphy and all those who entertained us on a very enjoyable evening. Congratulations and good luck to Gerry Mescall who is the Society Captain for 2019. Our Annual Golf Classic on Friday 22nd June was a great success with 45 teams taking part. A big thank you to all our teams, sponsors, those who supported our raffle and to Lucan Golf Club. A special word of thanks to the Golf Society Committee, and particularly Pat Keane for all the hard work in making the Classic such a great success. Congratulations to all the winners. Nearest the Pin: Colin Browne. Longest Drive: Ada Bowler and Stephen Murphy. 2s Club: Matt Burke and Tony Goode. Overall Winner John Clancy (21) 37pts BB9. 2nd Overall Eddie Shanagher (24) 37pts. Winner Category 1 Joe Donnelly (14) 36pts. Winner Category 2 Mick O'Hara (16) 35pts. Winner Category 3 Brian Mahon (24) 35pts.